“Dumbo” flaps but the film itself soars a bit lower! Animator Walt Disney made dreams come true to the animation and the film industry when crafting and producing such beloved animated features in the 1930s, 1940s, and 1950s. 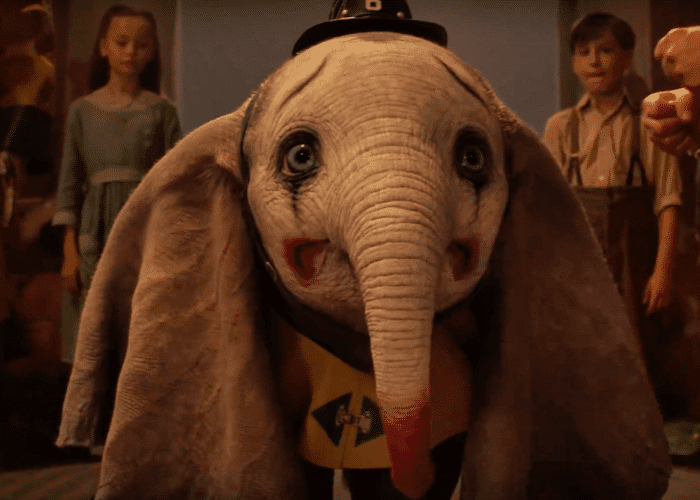 Tim Burton returns to direct this live-action remake based on the retellings of Walt Disney’s classic animated film, “Dumbo,” which was produced in 1941. The animated feature is exactly 64 minutes which is the shortest length Disney has produced, but Burton nearly doubled the time for more storytelling and give a little backstory for the adorable baby elephant with big flappy ears. Burton has previously helm 2010’s “Alice in Wonderland (which became his highest-grossing film to date),”2001’s Planet of the Apes,” and “Charlie and the Chocolate Factory.” Beginning from “Pee Wee’s Big Adventure” and 1980’s “Batman films” through “The Nightmare before Christmas” and “Frankenweenie,” the main part about Tim Burton and his career is Burton’s dark streak which is a visual stamp. But for high or low, praised or panned, none of those films could have been directed by anyone else. Here in “Dumbo,” the father (Colin Farrell) and the two children who are circus workers must care for the baby elephant (later dubbed as Dumbo) whose enormous flappy ears enable him to fly. As the struggling circus goes poorly lead by ringmaster Max Medici (Danny DeVito), a persuasive entrepreneur V. A. Vandevere (Michael Keaton) comes to acquire the circus to exploit the titular character. Burton nailed his role as the director, relying on his VFX and animation skill sets to achieve a live-action hybrid, it also had to deal with human frailty. Burton brings the sparking dazzle with music composer Danny Elfman, screenwriter Ehren Kruger (first three “Transformers” films), and character designer Michael Kutsche who sets a new gold standard on eye movement and facial expressions. After the success of Tim Burton’s “Alice in Wonderland,” the film had impacted the studio to produce such live-action remakes based on critical-acclaim animated films Disney has produced during and after Walt Disney’s lifetime. As of present, the world, the audience, and the studio have “Maleficent,” “Cinderella,” Jon Favreau‘s “The Jungle Book,” and “Beauty and the Beast.” Just to let the audience know we have two upcoming live-action remakes that are about to be release: “Aladdin” and “The Lion King” (also will be directed by Favreau). Colin Farrell appears as Holt, the disabled World War veteran and the father of his two children (portrayed by Nico Parker and Finley Hobbins) who lost their mother during his time at war. And what’s sadder is that not only he lost his wife, but also his arm. Aside from that, actress Eva Green (third collaboration with Tim Burton) rolls onto the big screen as a trapeze artist named Colette Marchant. Supporting actor Michael Keaton (fourth collaboration with Burton) appears as Walt Disney-like impresario V. A. Vandevere who runs an amusement park called Dreamland which bears a striking resemblance of Disneyland and Tomorrowland while Danny DeVito (also fourth collaboration with Burton) appears as a boisterous ringmaster of the struggling circus. Keaton really makes his role meatier and memorable like his performances from “Batman,” “Spider-Man: Homecoming,” and “Beetlejuice” while DeVito makes his role sounded somewhat boring but with pleasant attitude. Their chemistry as circus partners really bring up the whole story and the film’s dynamics when it comes to entertainment. Don’t be alarm this the third time Keaton and DeVito appeared together after “Johnny Dangerously” (1984) and “Batman Returns” (1992). Also appearing is the Oscar winner Alan Arkin who plays as the a Wall Street tycoon who will finance V. A. Vandevere’s plans if his circus show he integrated into his theme park became a remarkable success. Although, what’s disappointing that the script over complicates on the villain and supporting actors as the performances from DeVito and Keaton became the main problems of the film, eventually crushes the heart for the Dumbo character as opposed of making this film as fun as the animated version. I think the director went a bit darker on the sudden reveal of Dumbo at the beginning which is the main climax of the film. And what’s worst is family separation become a major conflict to both circus performers, families, and Dumbo. On the side note, “Dumbo” is good film but I will throw in some caution in there if you’re planning on seeing this film. I honestly don’t care what other critics would say whether it’s positive or negative, I just think this is a film with heartwarming moments but film doesn't always soar higher than ever. It maybe too scary and heartbreaking for a kids’ movie but on the inside, it’s a good family-friendly film Burton has to offer. It’s like “The Nightmare Before Christmas”-esque but with colorful animals and patterns of CGI usages. Although, I will highly recommend to watch the 1941 animated version as a pit stop before walking over to the “Dumbo” remake.